I think at this point we've all collectively agreed as a culture that even if Adam Sandler makes us giggle every once in a while, he's really past his movie-making prime. Yes, his cameo in the season finale of Brooklyn 99 was really funny, and yes, he was funny in Top Five, but neither of those was a project he was in charge of. And while Pixels could be funny, I guess, all anyone can say about Ridiculous 6 is that it is apparently so offensively bad that twelve Native American actors straight up walked off the set and have not returned. So, with all of this in mind, I thought it might be a good time to talk about one of Sandler's lesser known projects, particularly because this project will be releasing a sequel this summer. No, thankfully I'm not talking about Jack and Jill, but rather about the milquetoast, almost entirely forgotten, Hotel Transylvania. Did you forget that was a thing? I forgot that was a thing. 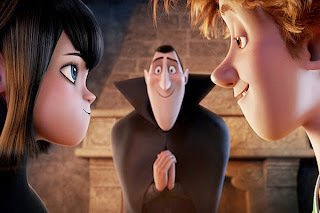 Hotel Transylvania is the sort of movie that should by all rights actually be really amazing. It boasts a singularly amazing cast of voice talent (everyone from Steve Buscemi to Fran Drescher), and the concept is unique enough to have potential. It follows Dracula (Sandler) and his little daughter Mavis (Selena Gomez) as they prepare for her 118th birthday. Dracula runs a state of the art, high end resort hotel for the monsters of the world, giving them a place where they can safely relax and let loose without having to fear that humans will find them and try to kill them. Naturally, then, the plot of the movie is about a human finding them. Said human is Jonathan (Andy Samberg), a schlubby backpacker who is exactly the right brand of thrill-seeking and stupid to ignore all the posted signs and wander right up to the hotel's front door. Dracula obviously can't let his customers find out that a human managed to find them, but he also can't just let Jonathan go and tell the other humans where the hotel is, so he has to think of another plan. Mavis and Jonathan lock eyes and fall deep into love at first sight. Obviously this is completely unacceptable to Dracula, who hates the humans and deeply fears them. His own wife was killed by humans just after Mavis was born, and he built this whole hotel to keep her safe. Not even a fake town simulation (full of ghouls dressed up as angry villagers trying to burn her at the stake) can keep Mavis at home now that she wants to see the world. So Dracula decides to take drastic measures. He forces Jonathan to tell Mavis he doesn't love her because she's a horrible monster, and then he flees. The monsters are all very angry with Dracula, but he quickly realizes that he's made a terrible mistake. Mavis is growing up and he can't stop that, blah blah blah, can't stop true love, blah blah, let's go catch Jonathan before he gets on that plane! And then they rush to the airport and bring Jonathan back home and then apparently he and Mavis get married literally immediately. Which is kind of distressing, but whatever. As I'm sure you can tell from that summary, Hotel Transylvania is by no means the worst movie Adam Sandler has ever made, but it is pretty bad. Not insofar as the content is actually bad, but because there is so freaking little of it. I mean, I had to really stretch to think if I left anything out, but I don't think I did. There is virtually no story here. 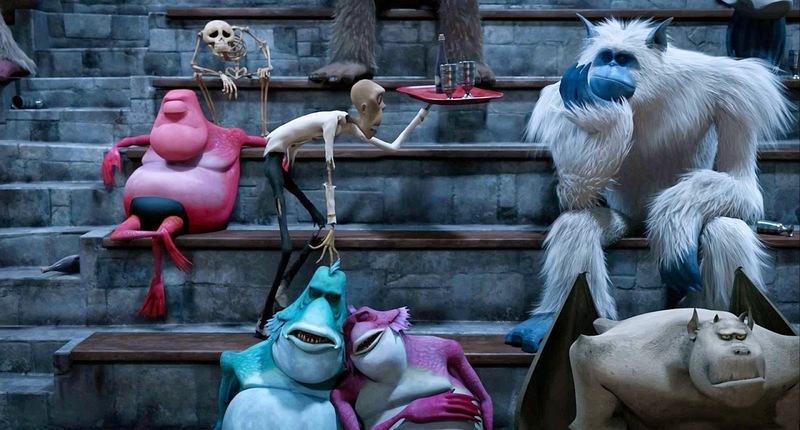 The majority of the film is made up of entertaining set pieces and just tiny story links between them. And that's terrible, frankly. It's terrible because it plays into the idea that movies for children don't actually have to be good as long as they are funny, but it's also terrible because this movie, like a lot of other Sandler franchises recently (like, say, Grownups) purports to be about the younger generation while refusing to let the camera take its focus off of the father. While Mavis is supposed to be the main character here, she's not. 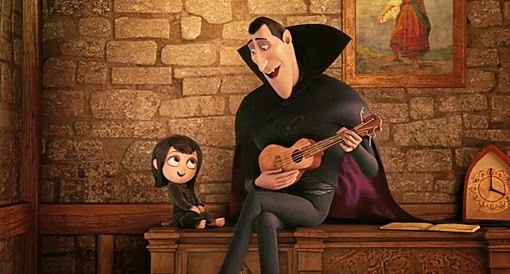 The whole movie is about Dracula and whether or not he will grant his daughter the freedom to live her own life. And, sure, I guess we maybe need more of those films (we don't), but why then pretend it's Mavis' story at all? Furthermore, the film tries to justify its bad plotting and confusing character interactions by insisting that Mavis and Jonathan fall into true love when they first meet eyes and feel that "zing." There's even a whole song about it, which you can look for on youtube if you're feeling dangerous, but that I do not recommend. True love is wonderful and all, but there's something distressing about creating a story world where anything can be changed as long as you feel a "zing" when you look at someone. 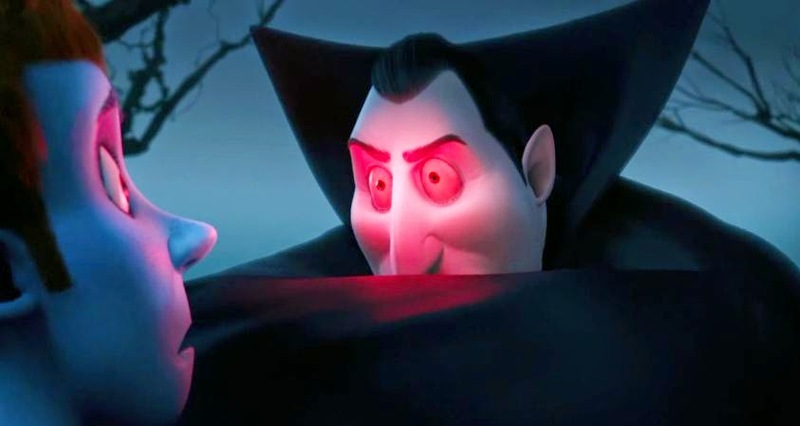 Dracula is willing to change is centuries long hatred of humans because his daughter got a tingly feeling when looking at one? That's weird. And while the climax of the film is cute and all, it's still kind of emotionally distressing, since Dracula nearly kills himself in the efforts to emotionally manipulate Jonathan into staying. Also also, the monsters spend the whole film in fear and trembling that the humans will figure out where they live, but then when they reach the outside world they find that the humans think monsters are great and even have a whole festival for them. They wander into town only to discover that it's having a monster festival. Upon learning that they have the real Dracula among them, the people are all quick to help him rush to the airport. Why? Why do the humans react that way, but more importantly, if the monsters other than Dracula have not spent the last century hiding from humans, how do none of them know about this? And we know that some of the monsters really haven't. While a lot of them do hide, some of them don't. Why don't the ones that don't mention this? Or do they mention it and Dracula shuts them up? Seriously, what the hell? But the overall impression I get from this film isn't that Sandler is trying to say anything profound about keeping secrets or the need for certain areas of society to modernize. I don't think Sandler is trying to say anything profound at all. None of these characters are. The reason Hotel Transylvania most bothers me isn't the trite storyline or numerous plotholes, but the very fact that it feels like such a paycheck movie. I can hear them all doing it for the money, and I don't like it. Now, bear in mind that I have no real problem with actors just doing films because they need money. Actors are humans too, and I can appreciate that they have bills to pay. But I dislike the idea that this entire film just feels like a contractual obligation. It's so paint by numbers that you have to wonder where it even came from. And this is problematic when you remember that this is one of the major studio releases for children. This is the best we could do? A film that really says nothing interesting or helpful about the world, shows only white characters*, is completely from the perspective of a wealthy middle-aged white man fretting over his daughter's virginity...why is this is a thing that needed to be made? Why this movie? We can do so much better, guys. So much better. It's especially frustrating because the idea that monsters need a place to hide from humans could have been an incredibly poignant story point. I mean, this could be a sort of X-Men type metaphor story where we talk about the way that marginalized groups are treated in the larger culture. Heck, knowing Adam Sandler, this film could have easily turned into a really interesting examination of the creation of Israel after World War II as a place where Jews could go to be safe and alone and not have to live in fear of their neighbors. What I'm saying is, there could have been something more there, but there isn't. There's really nothing to this movie. I've said it before and I'll say it again: nothing bothers me so much in media as mediocrity. I don't care if you make a movie so aggressively terrible that I can't watch it without laughing so hard I cry. If that movie was clearly made because you feel strongly that this is important and we should all respect it, I will appreciate your movie. Heck, one of my favorite films is the aggressively terrible Wolves of Kromer, a movie so bad that it took four viewings to even understand what the plot is. But I love that movie because for all that it epically fails, it is undoubtedly sincere. 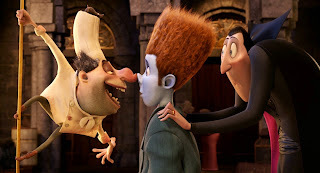 Hotel Transylvania is not sincere or good or even particularly funny. It has nothing larger to say. It just sort of is, as if the only thing you need out of a children's movie is the ability to entertain someone for two hours. But that's not all we need. We need a hell of a lot more, and I, for one, refuse to accept something that doesn't even try. 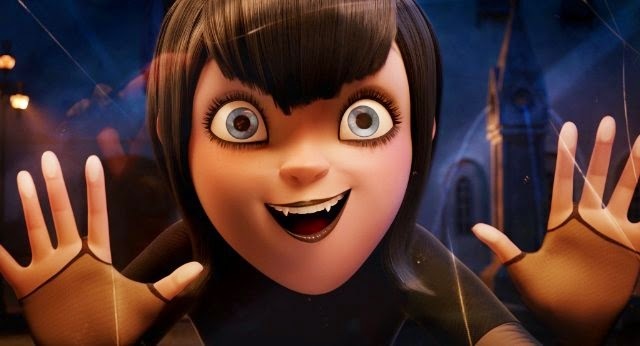 I would have really preferred a movie actually about Mavis. *I get that the mummies are implicitly black, but there are two of them, and we never actually see them as black characters.